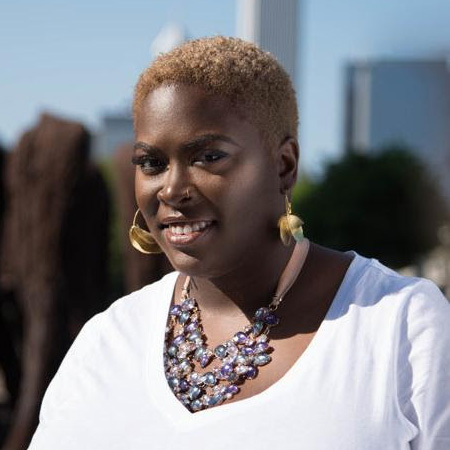 At last, we hope to finally understand what the Art Film Foundation (AFF) has in mind for solidifying and expanding the Art Theater’s service to the Champaign-Urbana community as its first executive director, Porshé R. Garner, Ph.D., settles into her role. A few weeks after announcing her hiring, AFF will host an introductory session with Dr. Garner at the Art later tonight, Wednesday, September 26, 7:30 p.m., for the public to get to know her better and watch her personal film favorite, the Tribeca-MGM television production HOLIDAY HEART (2000) starring Ving Rhames, Alfre Woodard, and Mykelti Williamson, directed by Robert Townsend (THE FIVE HEARTBEATS), and adapted by award-winning dramatist and University of Illinois alumna Cheryl L. West (Pullman Porter Blues, Akeelah and the Bee) from her own play. Its story, about an aging drag queen named Holiday Heart (Rhames) who becomes a friend and surrogate parent to neighboring teen Niki Dean (Jesika Reynolds) as her mother Wanda (Woodard) falls back into a drug-addled lifestyle, features a central protagonist in Niki whom Dr. Garner can emphasize with, according to e-mail announcements from AFF. Previously, Dr. Garner worked for a decade with Saving Our Lives, Hear Our Truths (SOLHOT), an empowering collective that teaches African-American girls in C-U to use the arts to explore their realities and possibilities, and recently earned her doctorate in Education Policy Studies and graduate minor in Gender and Women’s Studies from UIUC. The screening will be followed by a discussion session when she will presumably talk about the film, her work at AFF, and future initiatives. Attendees have the opportunity to “match their admission” whether they buy tickets on-line or at the front counter of the Art, in essence doubling the ticket price and donating the upcharge or more to the non-profit. May everyone have a good first night with Dr. Garner; we’ll always pull for our favorite little movie house to provide the best in quality programming at 126 W. Church St. in Champaign that engages and challenges us. p.s. Your humble editor just re-read The Art Theater: Playing Movies for 100 Years by Perry Morris, Joseph Muskin, and Audrey Wells, and can more easily see how the paramount goal of a community-driven venue like this one is to give its loyal audience what it needs. He will find it interesting to see how Years 101 to 105 and beyond are remembered if an expanded and revised edition ever goes to press. This entry was posted on Wednesday, September 26th, 2018 at 8:00 am	and is filed under Education/Classes, Public Events, Theatres & Venues. You can follow any responses to this entry through the RSS 2.0 feed. Both comments and pings are currently closed.